Well, the answer is yes, thanks to Citrix’s iPad application Citrix Receiver. Receiver is an application that connects with your Citrix environment to access your applications right from your iPad. 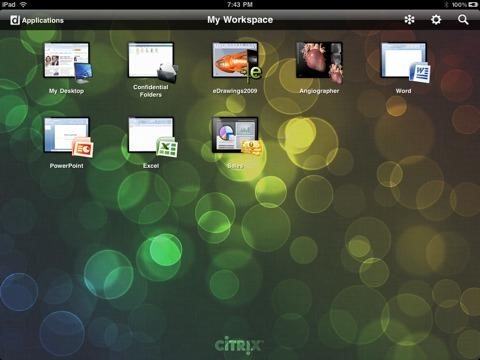 It even works in conjunction with XenDesktop allowing you to publish full desktops to your iPad user base. While there are some limitations with this application, namely the requirement of a Access Gateway in the DMZ, VPN Access, or some other sort of network configuration allowing your users into your network remotely, and issues with applications looking for the C: drive of a client machine, all and all I think its a great app. It’s something I use personally when I’m on call instead of lugging around a laptop. Besides, lets be honest; I look far cooler using my iPad than just some generic laptop. Citrix Receiver is available for the iPad via the AppStore. It is also available for the iPhone, iPod touch, and other smartphone devices, but hey, who wants to access applications on such a small screen.